Research has now shown that coffee has many health benefits. People used to think that coffee was just a satisfying addiction – like smoking but maybe not as bad. These days though, more studies are coming to light that illustrate how this drink is not only harmless, but in many cases may even improve your health. 1. Coffee can make you happier. According to a Harvard study, women who drank a few cups per day had a lower risk of depression than those who didn’t didn’t indulge in the habit. Similar results were seen with men in other studies. And the risk directly correlates with consumption: the more coffee you drink the lower your risk of being blue, which researchers think is a result of the effect of caffeine on mood neurotransmitters. 2. The drink may protect your brain. The Journal of Alzheimer’s Disease reported that coffee contains a substance that when combined with caffeine can boost levels of granulocyte colony stimulating factor (GCSF). This is a growth factor that seems to have the ability to ward of Alzheimer’s disease in mice. The amount of coffee used in the study would be the equivalent to consuming four or five cups for humans and has also been shown to decrease the risk of Parkinson’s disease. Scientists think that coffee may also play a part in creating brain cell connections and forming new neurons. 3. Coffee may protect you from diabetes. According to a recent medical review, drinking coffee reduces the risk of developing Type 2 diabetes, and the more you drink the lower your risk. This may have something to do with the drink’s positive effects on insulin sensitivity in the body. Another possibility is that coffee increases metabolic rate and some people who drink more coffee may eat less total calories throughout the day. 4. Coffee may lower men’s prostate cancer risk. A recent study at Harvard showed that men who drank six cups of coffee per day decreased their risk of developing a particularly deadly form of prostate cancer by 60 percent. There was also a 20 percent decrease in their chance of getting any other type of prostate cancer. 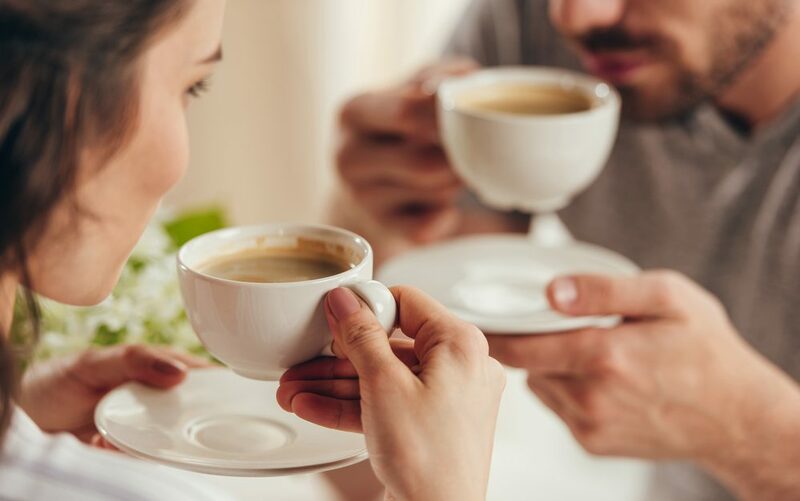 Fortunately for some, the study also revealed that drinking just a small amount of coffee – even one cup – can decrease prostate cancer risk by 30 percent. 5. Your cup of joe may help prevent cancer. New research shows that coffee could help to ward off basal cell carcinoma, the most common cancer in the world. Another study showed that women who drank at least three cups of coffee per day decreased their risk of skin cancer by 20 percent, while men in the same study had a 9 percent risk reduction. An important point is that decaf coffee didn’t have the same anti-cancer benefit so there may be something about the caffeine in coffee or the way it interacts with other compounds in the drink that attenuates cancer risk. Are you on a calorie deficit diet to lose weight? If so, a cup of sugar-free coffee should be your ideal breakfast meal. Sugar free coffee (some milk or cream is okay) reduces appetite, boosts mood, and helps you to stick to your diet plan. The caffeine in coffee is a mild stimulant thus has thermogenic effect. Some of the most popular dietary supplements like Phen375 (read review), Fenfast 375 (read review) contains lots of caffeine anhydrous. Have you heard about these diet pills? Relislim S6 and Relislim Herbal – Really Sensible Slimming? Invigor8 Fat Burner Review – Why it Does Not Melt Fat? Leanbean Diet Pill Review – Does missing stimulant make it great? Phen24 – Does Day & Night Formula Make Sense?